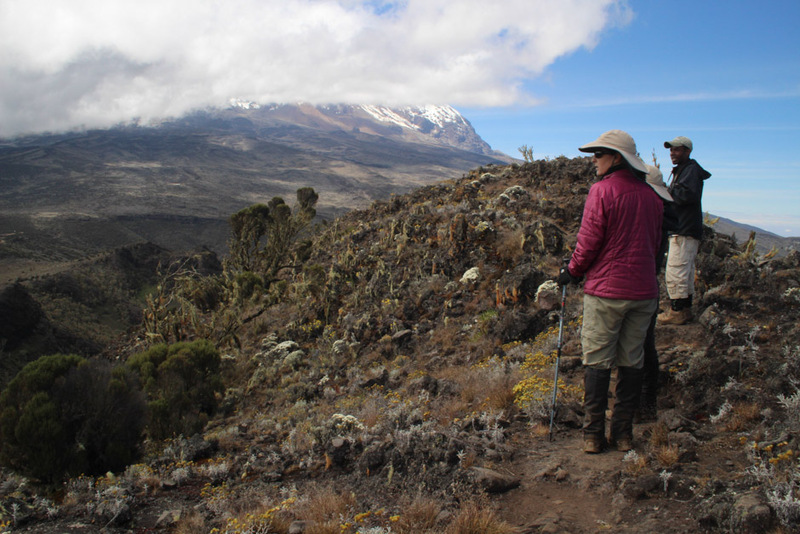 Before climbing Kilimanjaro, your outfitter will provide you with a packing list of all the necessary items you’ll need to bring with you on the mountain. In Tanzania, you will have a pre-trip briefing where your guide will go over the most important items with you again to make sure that you have not forgotten anything. But, if you are like us, you will want to ensure that you have everything you need before you arrive in Africa, so we have compiled a list of some of the gear that we found to be most useful and essential during our time on the mountain. Headlamp: Most people time their summit of Kilimanjaro for sunrise which means hours and hours of hiking in the dark on rocky and slippery surfaces. On the night of our summit, we were amazed to see a handful of hikers sharing headlamps with their guides and other people in their group. It is hard to imagine anything making this challenging night even worse than not being able to see where you are going. Make sure you have your own. You will also use your headlamp for the after-dark hours spent in camp. Tanzania is near the equator, so the sun goes down around 6:30 leaving you with several hours in camp before turning in for the night. You’ll need that headlamp for adding notes to your journal, playing cards or finding the sugar to add to your warm cup of tea. And you will desperately want a headlamp for trips to the outhouse in the middle of the night. 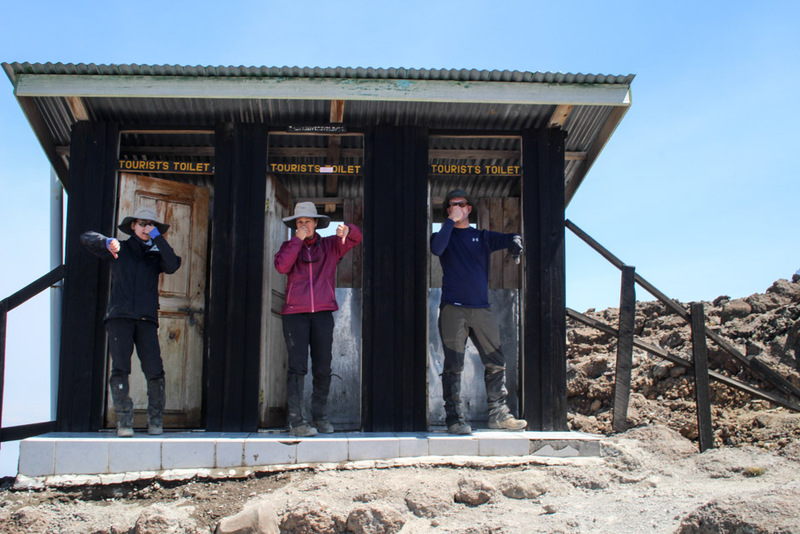 Sparing details, trust us when we say that you will want to be as hands-free as possible any time that you visit the latrine, especially in the middle of the night. 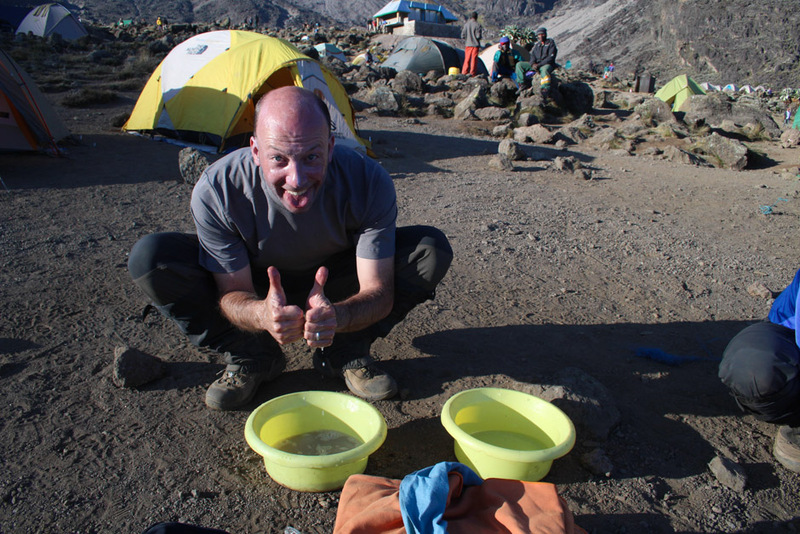 Wet Wipes: You will be greeted with a small basin of “warm water for washing” upon arrival in camp each day. But, with no prospect of a real shower over the course of your entire “dream” trip, you will greatly appreciate the opportunity to give the undercarriage a good scrubdown in the privacy of your own tent. ‘Nuff said! 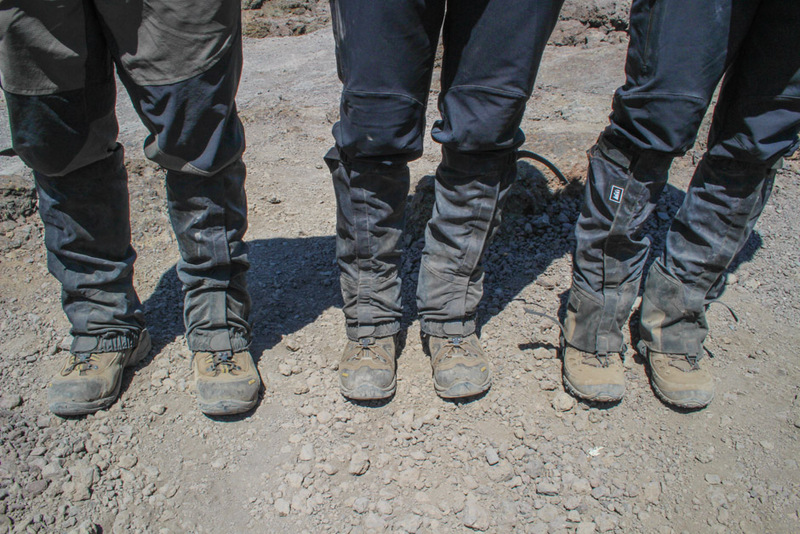 Gaiters: We had never really used these before climbing Kilimanjaro except for snowshoeing, but we were surprised at how much we enjoyed having them on the trek. Words can not describe how dusty the trails and campsites are. Gaiters go a long way to limiting the dust intake that finds its way everywhere–and we do mean everywhere (see above). Toilet Paper: Plenty of it. Take more than you think you could possibly need. It’s super light, easy to pack and cheap. And there are plenty of other things to stress out about besides running out of toilet paper, so live extravagantly and take a lot! Trekking Poles: We have been hiking with trekking poles for years now, and we absolutely love them. We know a lot of people think of them as being something for old people, but we consider them an essential. We once heard someone describe them as driving with 4WD instead of 2WD, and that couldn’t be more true. Additionally, they give you a lift on all of those tiring ascents, and they help with balance and footing on tricky descents. An added bonus is that they help minimize the swollen fingers you often get when hiking long distances. We beg you to get a set if you don’t already have them. Warm sleeping bag: Get the warmest bag you can afford both budget and weight-wise. Ours are only rated to +10ºF, so we got the warmest liners we could find for them, and we were still chilly. A liner from Sea to Summit will add 25ºF or 14ºC of warmth to your bag and is a lighter and cheaper alternative to purchasing an expensive down bag. Still, a good sleeping bag on the mountain is worth its weight in gold. Parka and snow pants: Even though these were on our packing list, we thought that we would be fine with just layering long underwear, fleeces and windbreaks. 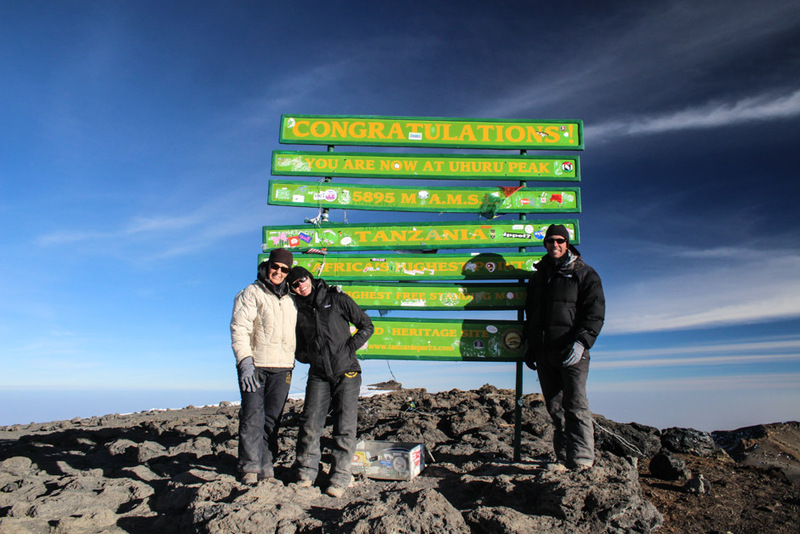 We nearly froze summiting on Meru and decided that we should rent some in Moshi. For a mere $20/item for the entire trek, they were well worth it, not only for keeping us warm on summit day, but also for being able to hang out in camp at night. In addition, you get the added bonus of looking like the Stay Puft Marshmallow Man in all of your summit photos, and, if that isn’t worth twenty bucks, we don’t know what is! Moon Boots– Okay, we didn’t have these, but we sure wish we did. If you grew up in cold climates, you probably hated it when your mother would make you wear these, right? But, when you pull into camp after a long day’s hike, there is nothing that you would rather do more than take off (and possibly burn) the very hiking boots that got you there. 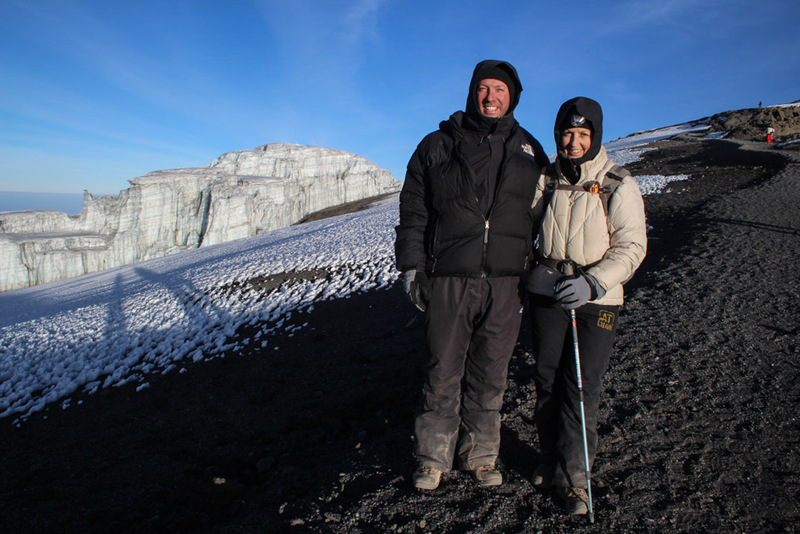 The problem on Kilimanjaro is that it is really too cold for any normal camp shoes. What other footwear is light enough to be carried, provides such warmth and can keep out the insane amount of dust you will encounter? Moon Boots! So, there it is—our list of hiking essentials. We hope it might come in handy for anyone planning a trip to Kilimanjaro in the future and help you make it all the way to the top. For those of you who have already been, is there anything we left off that you found really useful? Great list! I would note that extra batteries for the headlamp are essential. I had to change mine out on the way to the summit. Also, although I had all the warm gear and extra warm down sleeping bag, I wish I had a hot water bottle… extremely cold!!! and I completely second on the wipes. Bring loads and loads of wipes. Hot water bottles are the best! They gave us those at some of the hotels when we were traveling in Peru and Bolivia, and they made such a difference. We actually bought our own for the Salt Flat Tour (also at really high elevations) and then used them on cold, wintry nights in Chicago. If you can spare the weight, they would be a fantastic addition. Great idea! Sounds like you guys have this down to science. Thanks for the tips! I guess practice makes perfect. We have definitely learned a thing or two over the years. Thanks, Andy.